Sunday morning could not have been more beautiful, with warm sun, no wind, a crystal blue sky. Did we really have to leave? Reluctantly we pack up and head for the highway. 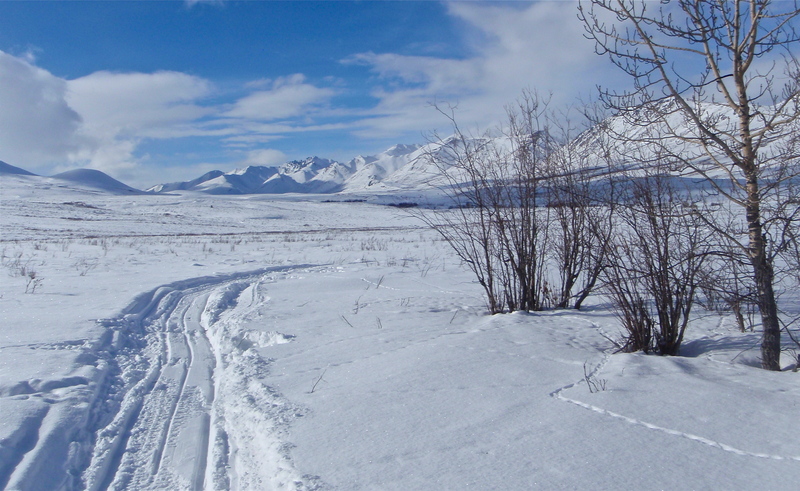 This being a fine spring weekend, recreational snowmobilers have been all over the valley, making quite a mess of the track. 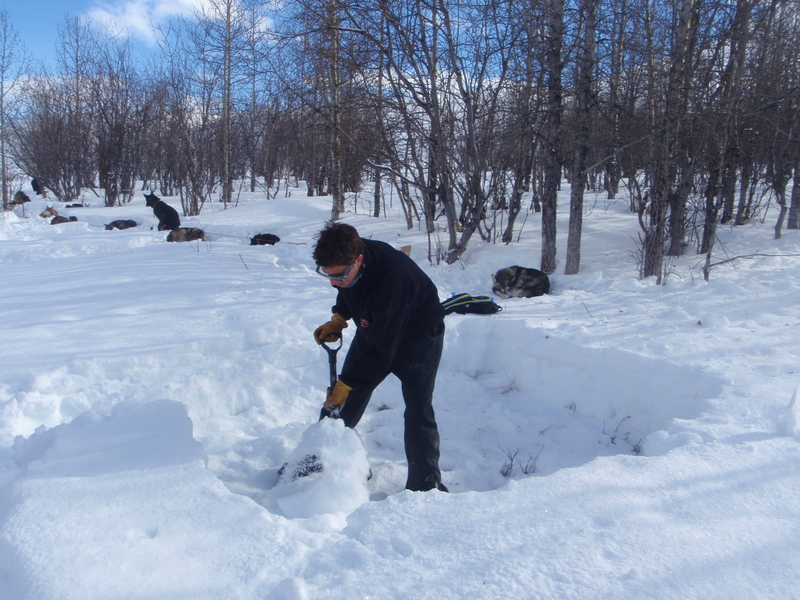 The sleds sink in soft muck and the dogs flounder, but we now have the skills to deal with difficult conditions. Looking back on our track from a difficult corner. Susan topping out on the difficult corner. Susan looking like a pro. Not the best mushing, but I’m sorry to see it end. I don’t know if I will manage to get back here again – certainly not for 2 or 3 years, and by then I may really be too old. 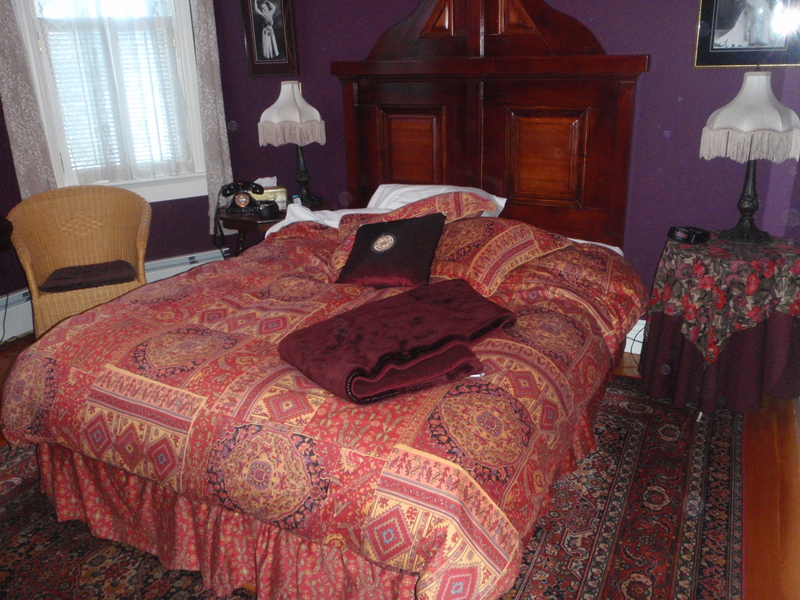 We drive back to Dawson City where Chris has booked us into Bombay Peggy’s, an historic old building once used as a brothel, now lovingly restored and offering 9 guest rooms, each exquisitely decorated. Yes, the hot shower felt good in the old-fashioned tub on 4 legs. The toilet flushed and the firm bed faced a flat-screen TV. Sherry and port were set out in the sitting room off the entrance. Paintings by a pretty talented local artist hung on every wall. I wished I was back in the Tombstones in my tent. 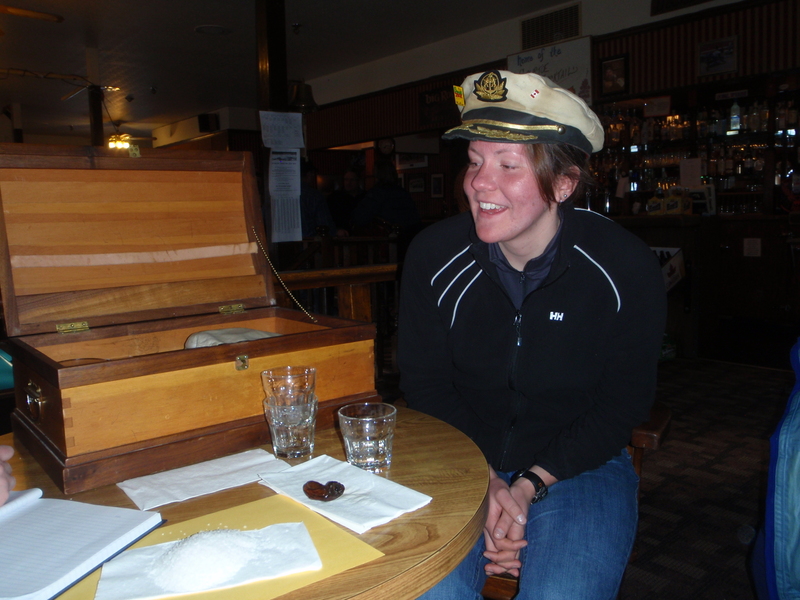 At 6:30 p.m. Chris led us to Jack London’s Bar and Grill. Not much doing on a Sunday night in Dawson, with at least half the town closed for the season, but Chris had a “treat” planned: the “Sour Toe Cocktail”. In a wooden chest the bar keeps a real, pickled human toe. The thing is quite disgusting. You order a drink, the toe is dropped into it, and the rules are read to you: the toe must touch your lips for it to count. Our 3 guides take the challenge, Chris having done it several times before, while Melissa backed out the year before, and Paul is new to the crew but is game for just about anything. None of the other guests are interested, but spurred on perhaps by a second glass of port at the hotel, I also take the challenge. I don’t know which was worse – the toe or the damn vodka I had it in (vodka in preparation for Mongolia). Anyway, I now have a certificate numbered 39,743. The world is full of idiots. 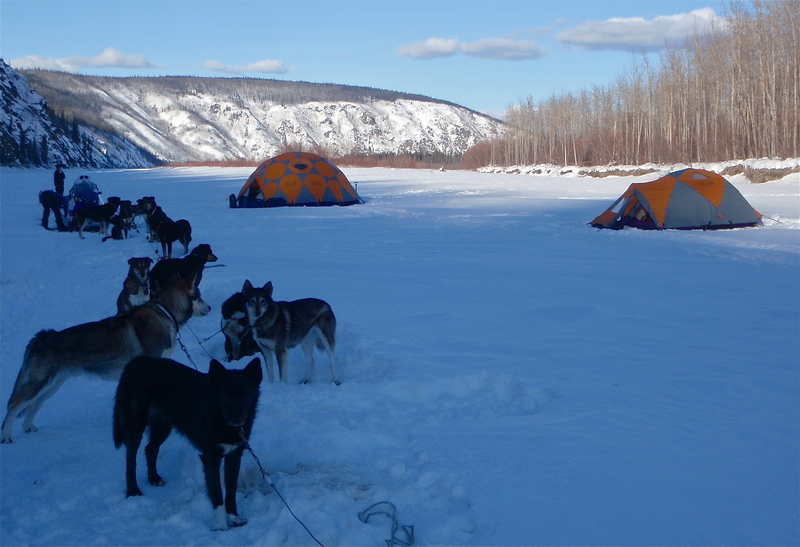 Our dog teams wait impatiently as sleds are taken one at a time into our camping site in the Tombstones. The personalities of these dogs are as individual as their looks. My wheel dogs (nearest the sled) are brothers, Whiskey and Mac, who are totally devoted to each other and are very calm, serious pullers. My swing dogs (behind the leaders) are Ali and Hudson. Ali is the mother of many of the dogs on our trip – sort of a queen bee, she goes about her business without fuss and doesn’t tolerate any nonsense. Hudson is a goof ball, always barking and looking around, not the brightest bulb in the sky but good natured and hard working. The two lead dogs are responsible for obeying my commands and getting the other dogs to follow them. Blue, unfortunately, is a space cadet; gazing around, wandering off trail, she shows only occasional interest in working, leaving Strider very much on his own. Since we will spend 3 nights here, we have to dig good tent pads. My back is too sore to shovel snow, so Paul generously takes over the job. This is a magical camp site, surrounded by mountains and animal tracks. Whoa! Where did that cold snap come from? When we woke up this morning the thermometer registered -28 C. I had begged Susan before we went to sleep to wake me if she was cold. She didn’t and consequently shivered all night while I was comfy in my bag (rated to –30). I remember thinking at one point that the night seemed unusually cold, but I just snugged up the bag around my nose and went back to sleep. By morning my 3 fellow campers were thoroughly traumatized. Today the dogs have to rest, so we get up late and do little. For breakfast, Chris cooks hash browns with bacon, cheese and salsa, and we drink coffee for a couple of hours. Paul takes the lads snowshoeing, an outing which seems to exhaust them. They are now talking mostly about multiple hot showers and flush toilets. Susan and I walk along the trail for a while looking for tracks, laughing a bit about the New York city guys. When we go to bed I give Susan my down parka to wear in her bag. Not wanting to have to breathe through a tiny opening to keep warm, I put on extra clothing. Of course, the night is not very cold, and I wake up in a sweat at midnight. Saturday is a halcyon day: sun, blue sky, a firm trail and the joy of driving 6 happy dogs through paradise. Well, 6 happy dogs eventually. Blue the day dreamer has been traded to another sled for Esker, a young but very competent animal, well able to take over a lead role. Unfortunately Strider doesn’t like her, snapping and snarling at every stop, and finally just lying down in the snow and refusing to move. So he is demoted to swing and goofy Hudson gets to partner with Esker. Surprisingly he does quite well; at last I have 6 dogs working together! 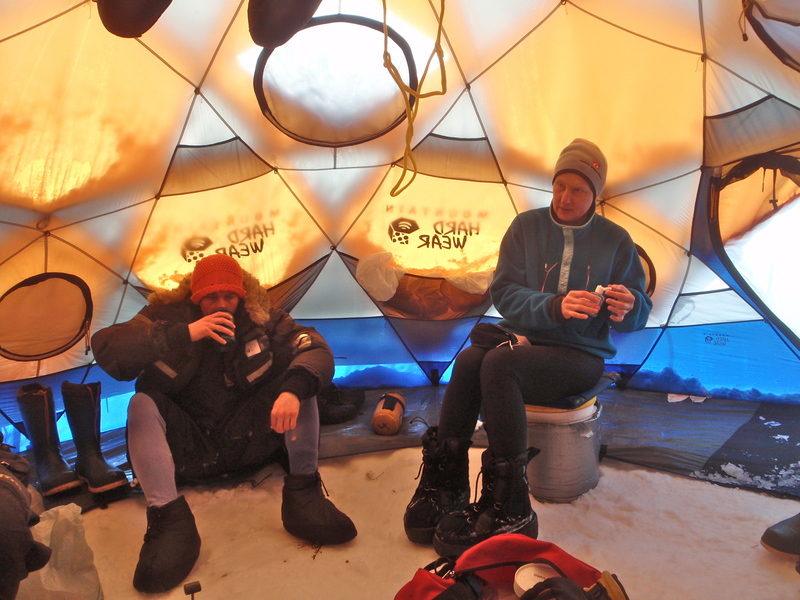 We run for 11 miles, turn around with some confusion and stuck sleds, have a long stop for lunch and return to camp in a state of bliss. There are few pleasures to rival this historic form of transportation when conditions are good and the feeling of wilderness is profound. I know that I have left a part of myself in this valley. We have daiquiris and snacks before dinner. Chris asks us what we have missed most on the trip. The 3 Americans speak of soft beds, hot showers and flush toilets. I say simply, “my dog”. I belong in this wilderness – the others are visitors. 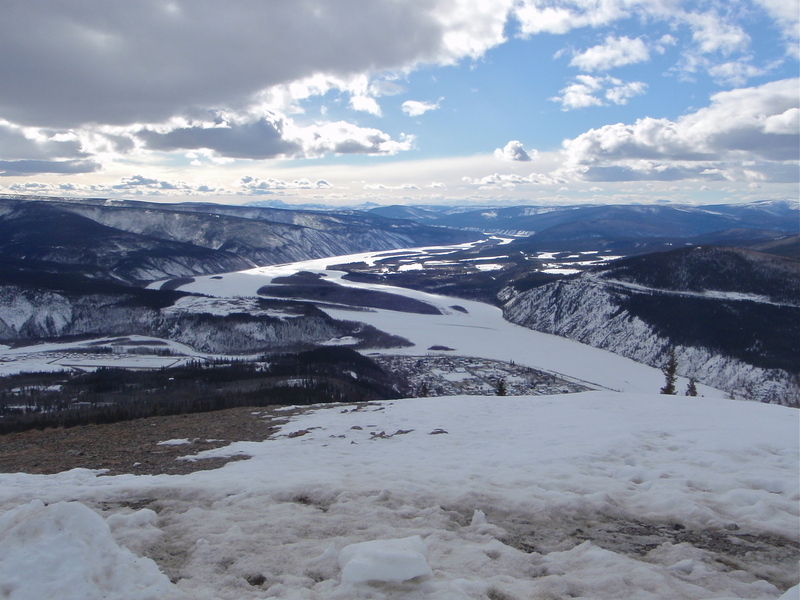 The Yukon River, where we spent our first 3 days mushing and camping. Tuesday, we go for a day trip up the river (easier than moving camp). 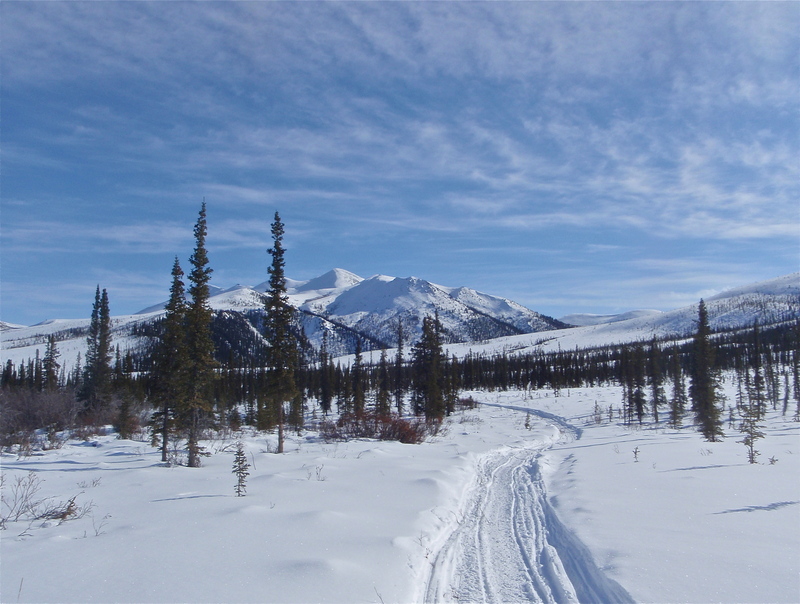 We have to deal with a lot of jumbled ice and places where snow has avalanched off the river bank, covering the trail; as well, warm weather has made the track soft and sled handling difficult. Somehow I pick the one bit of flat ice to go flying off my sled, landing hard on my tailbone. For a few moments I’m afraid that I may have compressed a disc, but soon realize that it’s just the muscles in my lower back seizing. I stretch as best I can and continue, but the rest of the week will be too strenuous to allow much recovery. We don’t go as far as hoped because the heat is too much for the dogs. Back in camp Chris (wonder woman!) produces well-laced margaritas and snacks before dinner. The boys re-evaluate their camping technique and decide to use both sleeping bags. I ask Susan to let me know if she is cold, as I have extra clothing, but she toughs it out, sleeping poorly and shivering a lot. 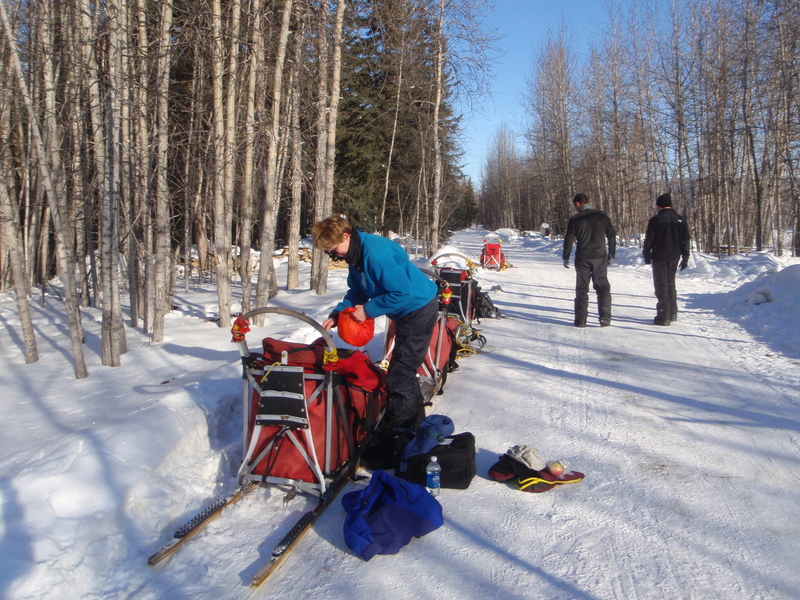 On Wednesday we drive back to the campground in Dawson, all of us showing much improvement in our mushing skills. We decide not to put up the tents because there is a cook shelter in the campground with plastic over the windows and doors. 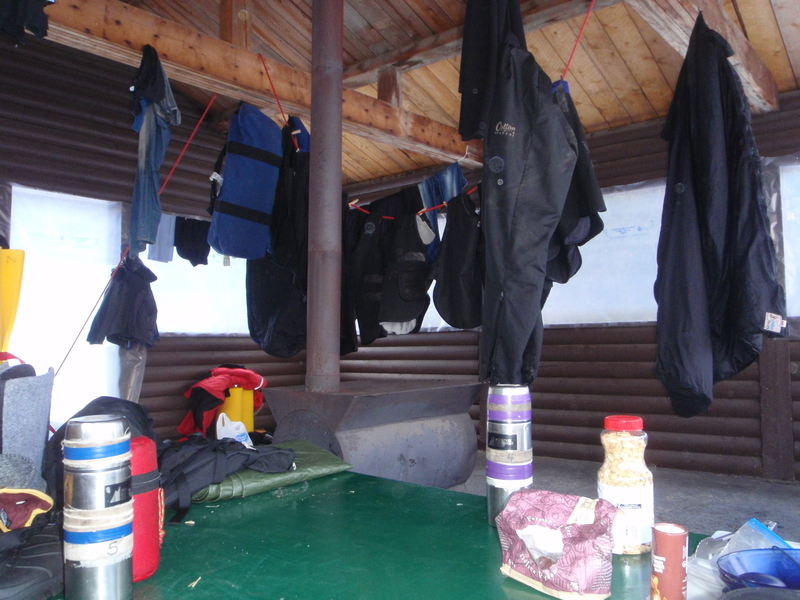 We gather wood for the stove and turn the shelter into a drying room for gear and a warm refuge for us. To get to the Tombstones on Thursday we have to drive up the Dempster Highway. This means loading dogs. sled and skimmers into the trucks. 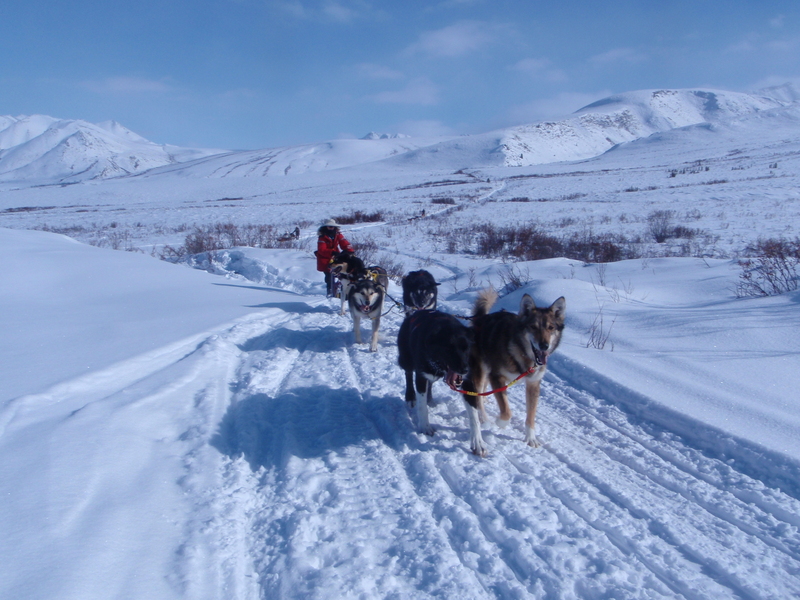 Loading the dogs into their individual compartments on the trucks creates almost as much chaos as hitching them to the sleds. Alaskan huskies are basically mutts, the result of breeding huskies to other breeds. Smaller than you would expect (the odd one reaches 100 lbs, but most weigh a lot less), some with short hair, some long, thick coats, thin coats, blue eyes, brown eyes, mixed eyes, all different colours, most with semi-floppy ears – they are a motley lot. They know and want to do only one thing: pull. As we drive up the highway we gain elevation and finally enter Tombstones Park. It’s a beautiful area where snow-wrapped mountains cast a magical spell without overpowering the valley visitor. It takes more than an hour after we pull into a parking area to unload dogs, sleds, skimmers and snow machines, get packed, harnessed, hitched and ready to travel. Nothing happens quickly on a sledding trip. Susan controls her team as she waits for the final dog to be hitched up. The West Hart River valley is broad, showing the typical U shape of glacial carving. 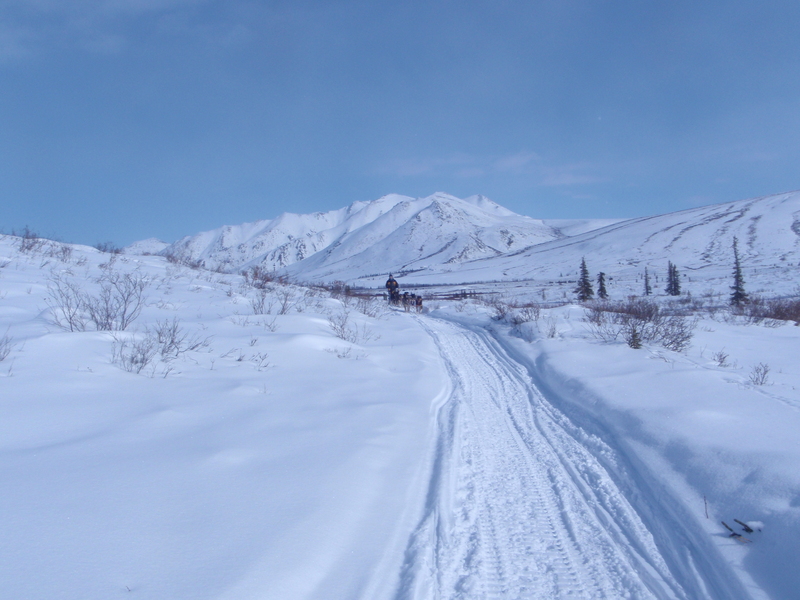 Mushing here is much easier than on the Yukon River, the trail going up and down gentle slopes, with few trees to worry about. We go in about 11 miles to the first stand of trees – needed for tying out the dogs as well as offering some shelter for us. We will camp here 3 nights. 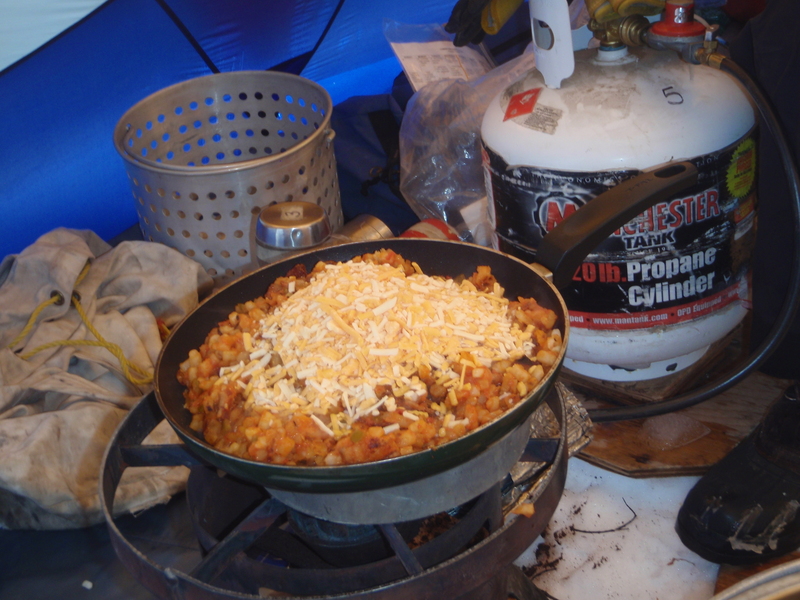 Winter camping in the Yukon wilderness is definitely an acquired taste. 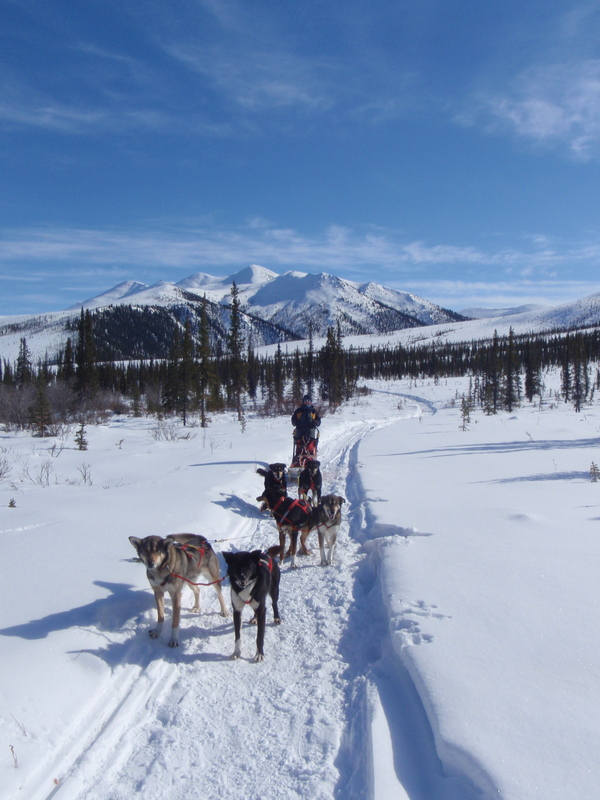 A few years ago I spent a February week with some very hardy participants mushing dog teams on part of the Yukon Quest trail. My fellow adventurers were from Europe and Montreal, had never done anything like this before, but were game to give it their best effort. I never heard a word of complaint, but short days and long nights where the temperature often dipped to -30c wore on all of us. 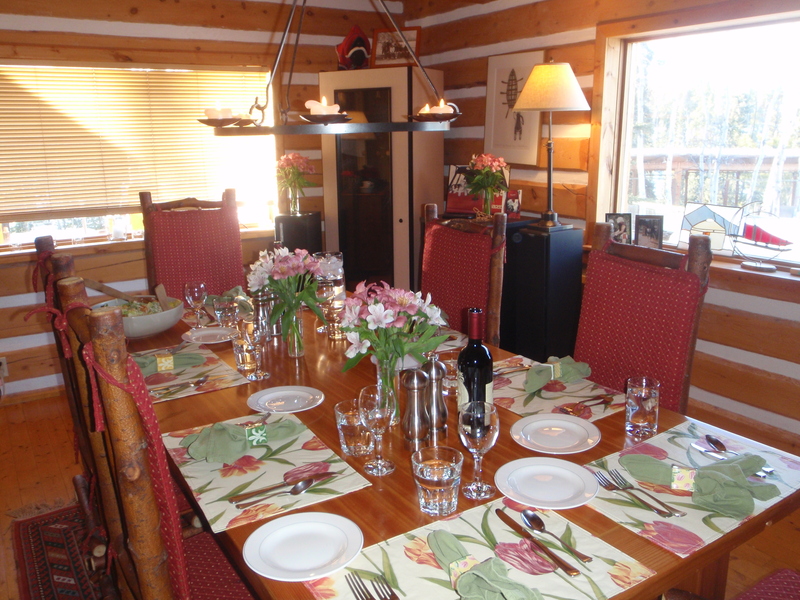 As an experienced snow camper I was probably the only one who was really having fun, and even I agreed, halfway through the trip, that a return to the lodge, where we could do day trips, would be a good idea. This year I decided to try a spring trip, where the sun would give warmth and the longer days would allow time to relax after the dogs were tended to and camp set up. 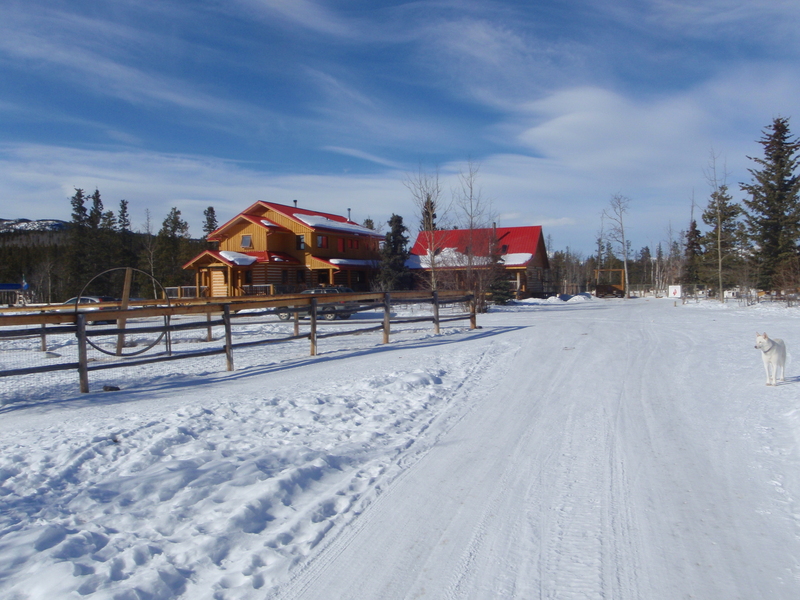 Once again I arrive at the Uncommon Journeys Homestead near Whitehorse, eager to meet my fellow adventurers and explore a new region: the Tombstone Range north of Dawson City. There are two young men from Manhattan and Susan, a somewhat older woman, from Washington D.C. To my dismay I discover that they all had expected to be sleeping in heated yurts on the trip, only learning the brutal truth a few days before. 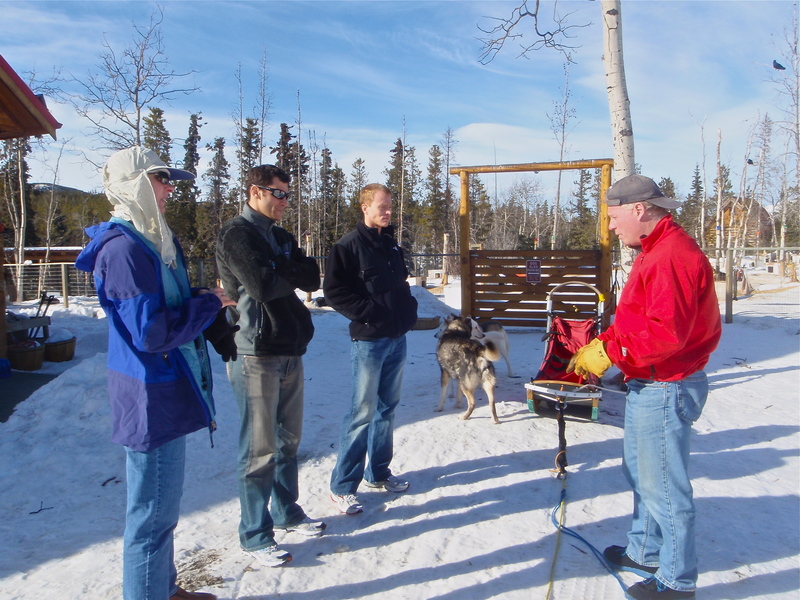 Uncommon Journeys is run by Rod and Martha Taylor and offers novice mushers a chance to experience the historic method of winter travel in northern Canada. Many of their dogs are veterans of the Iditarod and Yukon Quest races; all are cuddly, fully socialized creatures that are willing to put up with a new set of greenhorns every week. The dog yard contains about 70 animals and anyone is allowed to go in, unescorted, at any time to play with them. and sit down to a delicious dinner in the elegant main building. Next morning, Monday, we board a plane for Dawson City, outfitted with arctic parkas, pants, boots, sundries and large duffels. After a one-hour flight, we are picked up by Chris, our head guide, and driven to a campground on the Yukon River, where we meet Paul and Melissa, the 2 assistant guides. Paul is a delightful young man from South Africa who is seeking adventure around the world for a few years before settling down. Melissa is a nurse who took a leave of absence to work with the dogs this winter, her second with Uncommon Journeys. We will spend our first days on the river, perfecting our skills. 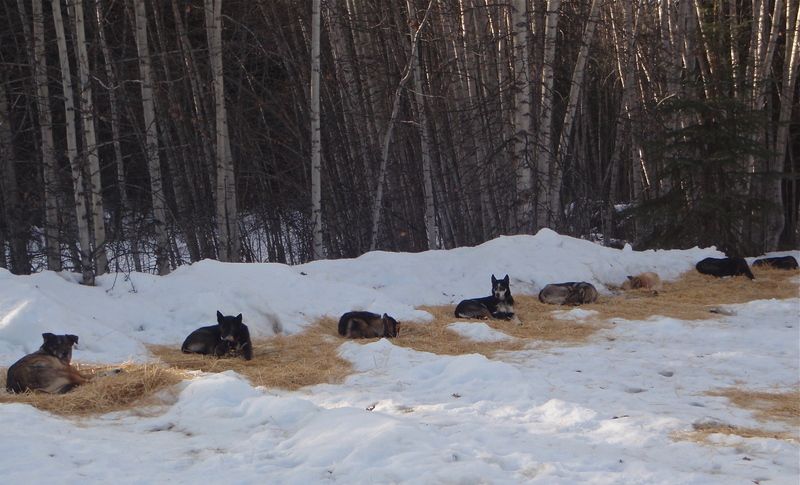 The dogs were trucked up from Whitehorse the day before and are staked out on lines, resting on straw. Chris shows us how to pack our sleds before we harness the dogs and hook them up. Words cannot adequately convey the chaos 0f 28 dogs jumping, howling, pulling on the lines, eager to be off and running the instant the first harness appears. People who claim that mushing is cruel must never have seen sled dogs in action; the cruelty they fear most is being left behind. 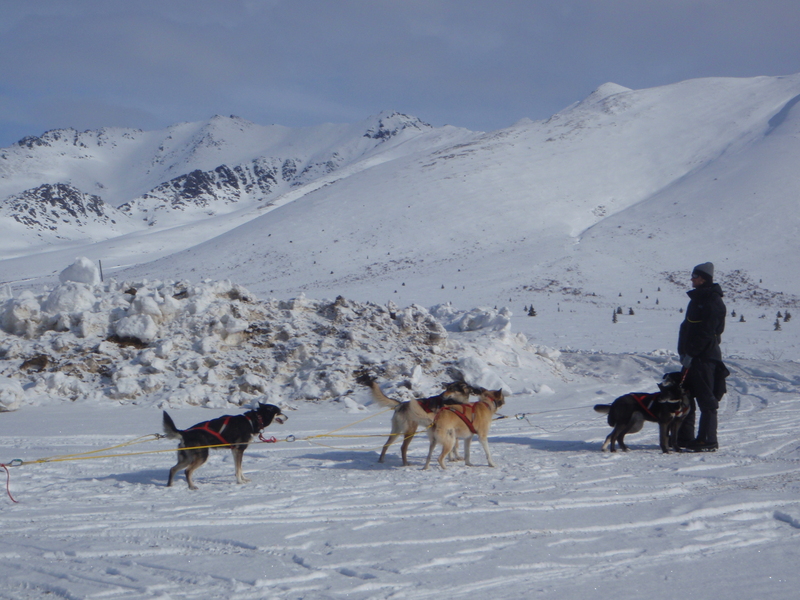 In addition to our dog teams we have 2 snow machines, each pulling a skimmer loaded with camp gear and food. When all is ready, Chris drives her machine a short way down the campground road and stops. 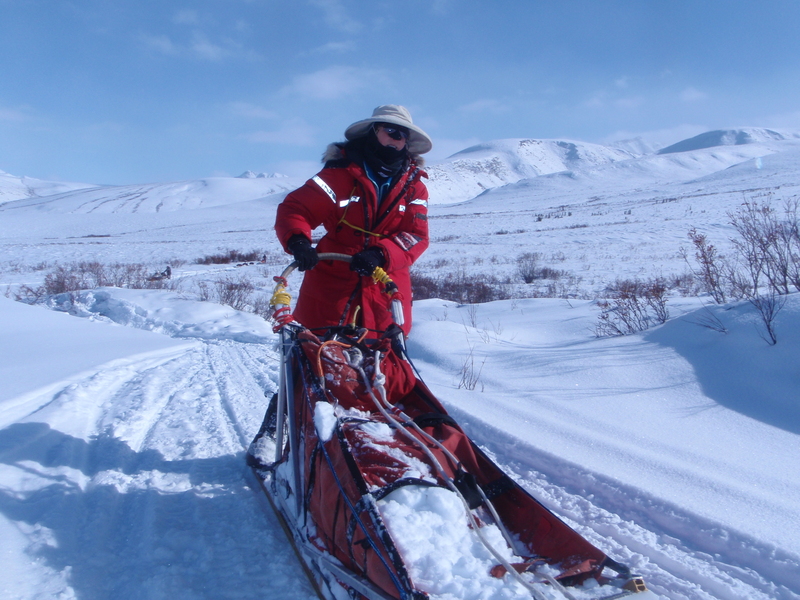 Each sled is released in turn, the dogs galloping madly until we drag them to a halt behind Chris. Paul and Melissa gather the remaining equipment and stakeout lines and drive their snow machine up to the group. 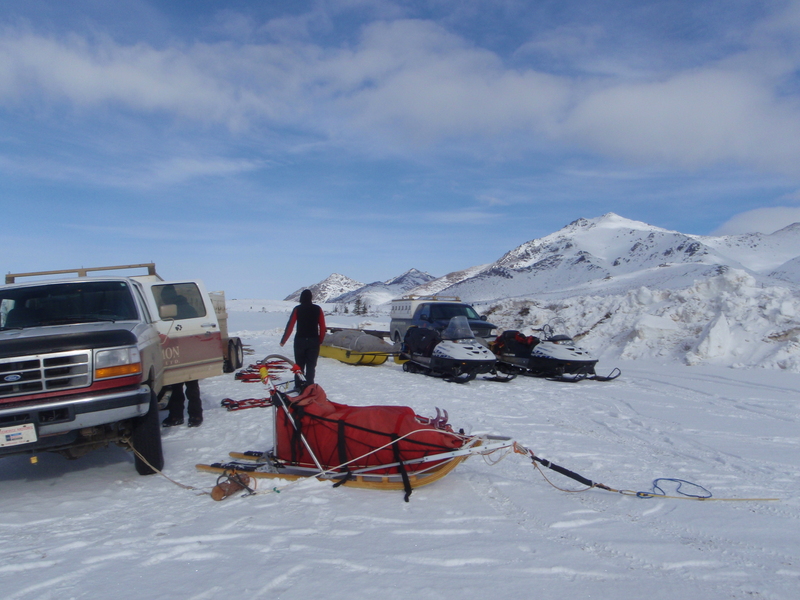 The turn onto the river is deemed too technical for us, so Melissa and Paul take each of our sleds. Once on the river we find the first few turns too challenging for our feeble skills. I think 2 people lost their sleds almost immediately and only blind luck kept me from being number 3. 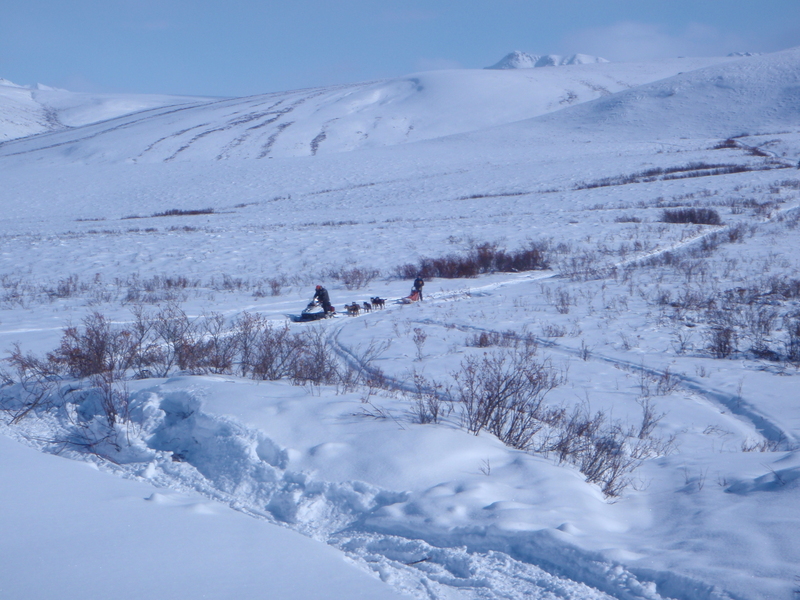 Good weather and beautiful scenery pass unnoticed as we are busy trying to control the speed of the dogs and keep the sleds upright. 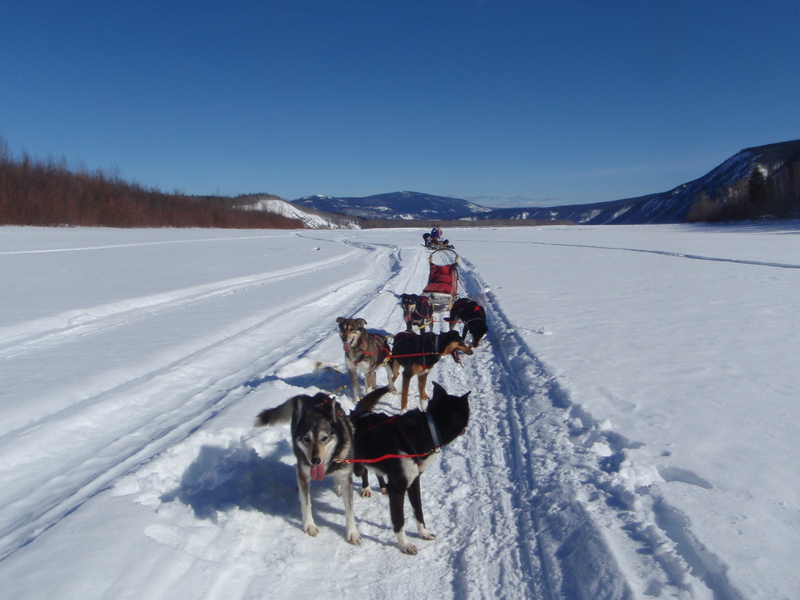 We manage only about 11 miles this day; although the dogs can travel at 7-8 mph, the sun is hot and we have to pause a few times to rest them (or to reunite a fallen driver with his or her sled). Camp is set up on the river – a time-consuming process. First the stakeout lines have to be attached to ice screws, so Paul and Melissa go ahead to do this. 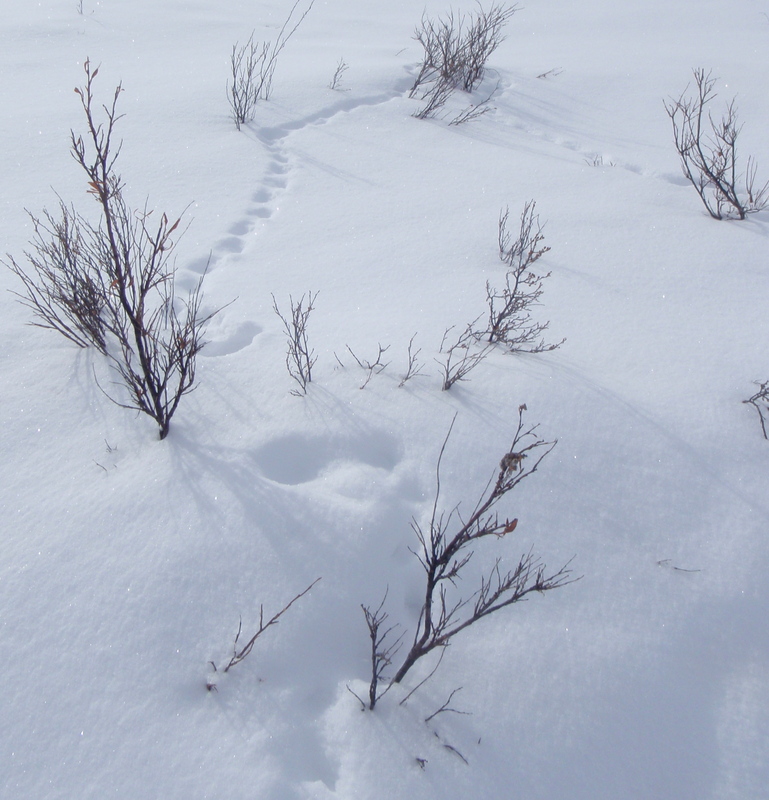 One at a time the sleds drive up, and the dogs are unhitched, unharnessed and staked out. The dogs are only half the battle. 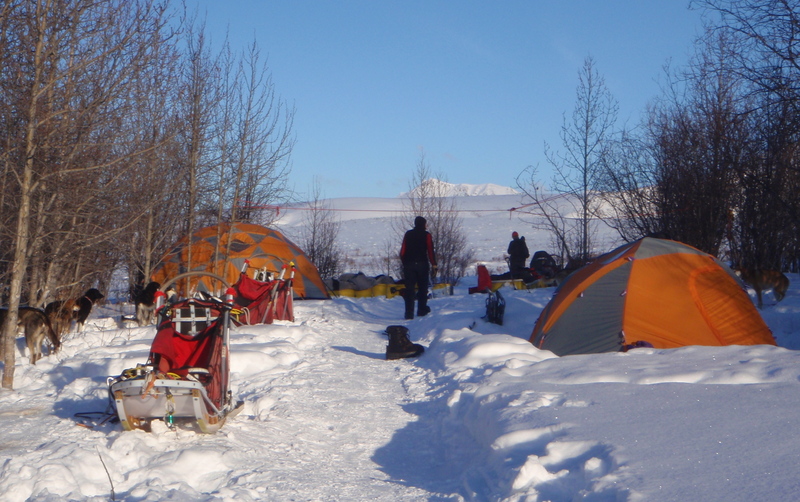 We have to put on snowshoes and stamp out platforms for our individual tents and the huge cook tent. The lads from New York are quite out of their element, while Susan, who grew up in Minnesota, is at least familiar with winter. Erecting the tents requires some know-how, so we are slow this first time. Meanwhile, Chris starts the propane burner in the cook tent and begins melting a huge pot of snow, while Melissa and Paul give the dogs some broth. 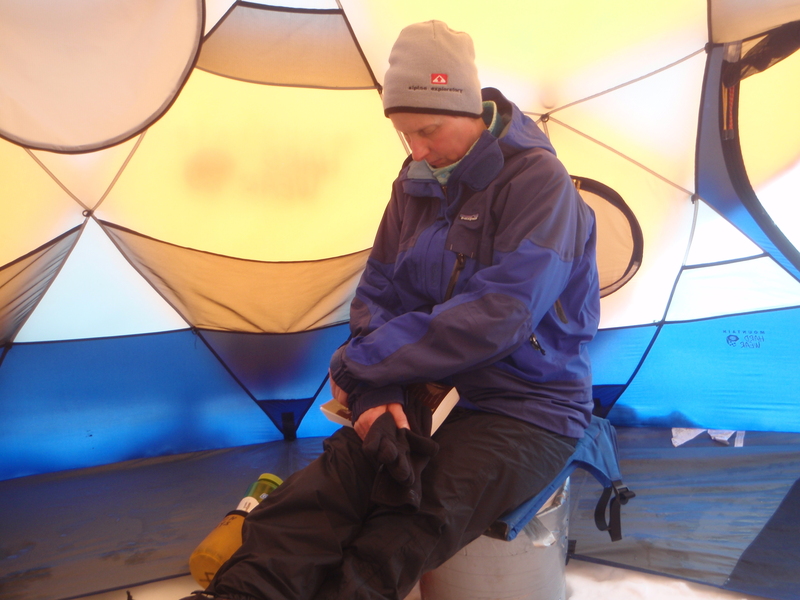 The tent soon becomes a steam bath because Chris has to bring the water to a boil with the stove raging. Once boil is achieved, she turns down the flame and we go inside. We have camp seats that most people put on the snow, but Chris, Susan and I get buckets to sit on – much easier! 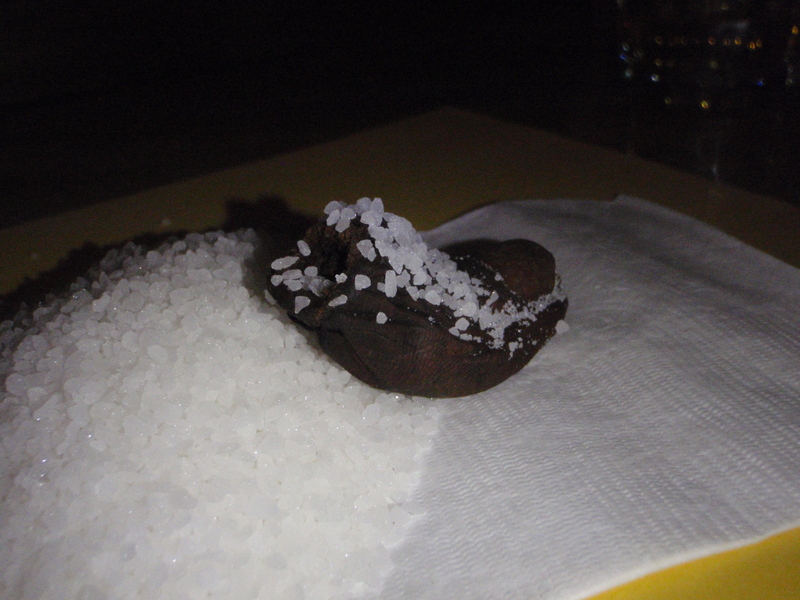 Our dinners were individually frozen in plastic bags at the Homestead, to be placed in boiling water to heat. We eat out of the bags, leaving no dishes to wash. Hot drinks follow, then the dogs have to be fed. 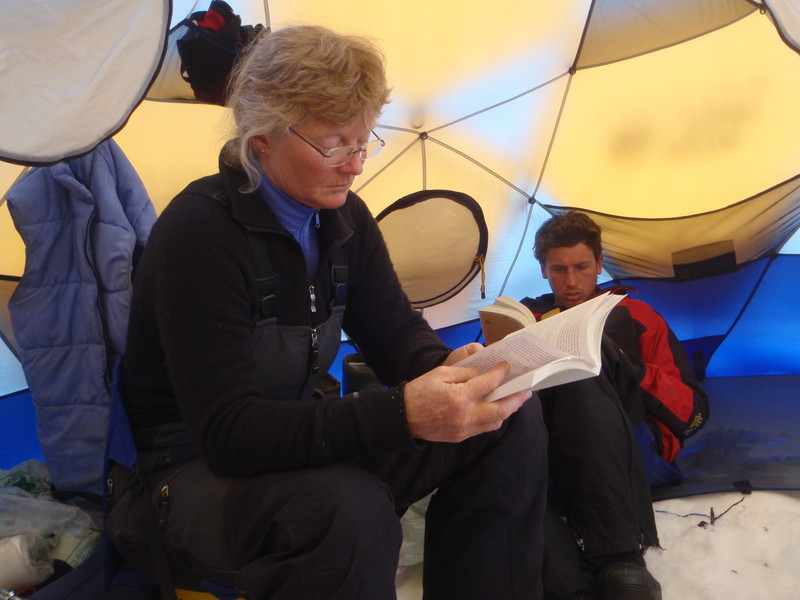 The four of us retire to our tents, while the guides sleep in the big tent, along with one or two lucky dogs. End of an exhausting day. Although I provided my own sleeping bag, the others are using a very warm double-bag system from Uncommon Journeys. The Manhattan contingent, in their innocence, decide that they need to use only one of the bags: by morning they are half frozen and wondering what they have got themselves into. Susan uses both bags, but is still cold. I sleep like a baby.